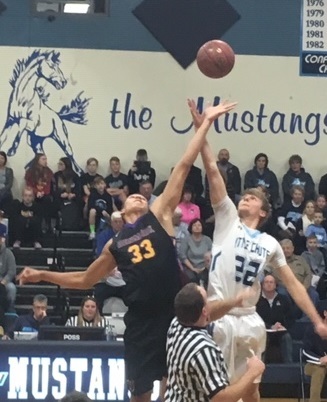 DENMARK – There weren’t many folks on hand for the Denmark boys basketball team’s road trip to Fox Valley Lutheran on a night of iffy road conditions. Of those who made it on Monday night, a large portion were in one way or another related to Brady Jens, Denmark’s sharp-shooting guard who was playing in just his fourth game since returning from an ankle injury suffered before the second game of the season. Jens treated those family members – his mother, his aunts and uncles, assorted cousins – to his best performance yet, raining in his first three three-pointers and scoring 13 points to help the Vikings stave off the upset-minded Foxes, 55-41, in North Eastern Conference action and leaving them, briefly perhaps, atop the standings at 10-2, pending the outcomes of Wrightstown’s and Freedom’s games on Tuesday evening. With Jens’ shooting touch starting to return, what remains is getting comfortable enough on the ankle to bring his other signature weapon back into play – his slashing drives to the basket. Short, the league’s leading scorer coming in, picked up his second foul three minutes into the game and sat the rest of he half, finishing 18 points below his average. Combine that with the fact that Denmark make only 5 of 23 shots from beyond the arc and it’s kind of amazing they came out of Appleton with a win. They did it by shooting 70 percent from inside the arc, making 14 of 20 shots, led by 6-8 Patrick Suemnick utilizing his size to score 23 points, grab nine rebounds and block four shots. Denmark, which struggled against FVL’s packed-in 2-3 zone and committed a slew of turnovers, could never pull away until the end. The Foxes led one time in the second half – 37-36 with 9:19 remaining. The Vikings outscored them 19-4 the rest of the way and held them to no field goals over the final 5:44 of the game. Suemnick answered that brief FVL lead with a three-pointer and Short added a tough baseline drive. A Fox Valley three whittled the Denmark lead to 41-40 and the game remained in the balance with under six minutes remaining. But Suemnick followed with two spinning buckets in the lane and Jens scored twice on layups. Demark made six free throws over the final minute to put it away. One of those relatives of Jens, cousin Spencer Jens, scored seven straight points for Fox Valley Lutheran early in the second half to keep the Foxes within striking distance. He and Brady took pictures together after the game as an assembly of Jenses and Jenses-by-other-names gathered for several minutes following the contest. “My mom is the youngest of 16 so I’ve really got a big family on that side,” Brady said with a laugh. After Zach Gezella opened the game with a three, FVL scored eight straight points and led until Brennen Miller’s layup off a Jack Satori feed put Denmark briefly back on top. Jens’s third three of the game knotted it at 16-16 at the midway point and Suemnick’s spinner in the lane put Denmark on top for the next 16 minutes. Denmark led 28-21 at intermission, despite 10 turnovers and 15 minutes of Short on the bench. Satori finally found some seams into the top of the tough Fox zone in the second half, opening up some shots inside. Satori finished with six assists, six rebounds, two steals and four points. But the zone remained a puzzle to solve most of the night for the Vikings, and it didn’t help that the shots weren’t falling. “Zane being out in the first half is a real zone-breaker with his penetration and being able to get guys open,” Stelmach said. “We knew coming in that 2-3 zone was going to slow things down so we weren’t too worried about it. It would have been nice if we’d shot the ball better. A couple of those three-pointers go down and it’s a different story. Short had four rebounds, two assists and a block to go along with his six points, while Miller dished out three assists and scored four points. Denmark knocked down 12 of 14 from the line. With big games down the road with Wrightstown and Freedom, co-leaders atop the standings before Denmark’s win on Monday, Jens’s contributions are going to be critical. It’s coming along he says, but it’s not quite there yet.